I didn’t make it to the Wisconsin Solidarity rally in SF today. I’m kind of antisocial these days, what with another person inside of me 24-7. Instead, let me tell you what I know about state workers. My partner, Peter, is an employee of the State of California. He just got a promotion, so I’m not sure what his new salary is, but I think I still make more money than he does. And I work at a non-profit advocacy organization! That is to say, neither of us make a lot of money, but you’d think that the taxes from the 5th largest economy in the world would result in higher salaries than $35 memberships from transit geeks. Not so. Oh, but the benefits! Those amazing health care perks and pensions. Well, Peter has been a state employee for 2.5 years, which means that he gets some of his health care premiums paid for – but not all. And yes, there is a pension fund, but it’s not likely to be sufficient for retirement anytime soon. The payout, once vested, is 2% of salary multiplied by total years of employment. So, if Peter stays with the state for 20 years, he would be eligible for 40% of his salary (average of highest three years). This is not indexed to inflation so after 20 years, it’s definitely not enough to feed us and pay for the Fruitbat’s college tuition. I remember my mom’s benefits getting rolled back throughout my childhood. Losing family health care benefits must have been pretty stressful, especially after my dad developed a chronic health condition. But just like airplane food ended up in the toilet after price deregulation, employee benefits have steadily been rolled back for no other reason than because, well, everyone was doing it. Private employers don’t gain anything by offering good benefits, because we the people don’t expect them. Without unions, we don’t have a way to ask for them, even if we decided we were worth it. I am grateful for everyone who has slept outside in freezing cold weather in Madison to keep the protests going. I am grateful that my partner and I both have jobs where lower-than-average pay is balanced by higher-than-average benefits. I’m also grateful for weekends, and the 8-hour workday, and paid holidays, and other humane aspects of employment law that were achieved through – you got it – collective bargaining. These benefits are already being steadily eroded in the private and public sectors as we’re expected to work more overtime, told that the company can’t afford health care premiums, and made to feel so indispensable/vulnerable that we can’t take the vacation days we accrue. If we start to lose collective bargaining, we lose the only means by which some of us can push back. 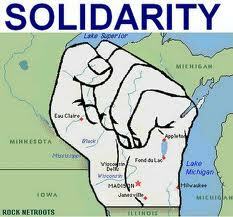 Wisconsin, Ohio, and Indiana are on the front lines in a fight for EVERYONE’S working conditions. I love this! My mom just retired from many, many years of working for the state. She had a lot of perks, but the pay wasn’t all that great. In fact, as a single mother, there was actually a time when she had to work at a video store part-time as well as working for CalTrans full-time in order to pay the bills.